Scuba diving sites vary greatly and when comparing and understanding dive site reviews it is sometime difficult to know what to expect even after reading the review. Getting a consistent process or method to rate dive sites from the cold water of the Atlantic and North Sea to the warm temperatures of the Pacific, Caribbean, and Mediterranean to a variety of inland waterways is the objective . We all know you can find great dive locations around the world and in many locations. However, what makes a great dive site? To compare scuba diving sites I have designed a simple rating system for Dive Site Reviews that has a number of key components. When rating the actual dive site I apply a weighting system to each category to come up with an overall rating for the site. First, I apply a simply 1 to 5 unweighted score for each category that is applicable to the dive site. Then the rating tool uses a weighting scale for each category that I developed based upon what I consider the relative contribution of each category to an individual dive. For example I consider encountering pelagic species, sharks, large rays etc. to be more important than Access, Current or Depth. The Old Airport Road Manta Ray dive site in Kona, Hawaii rates highly due to the amazing Oceanic Manta Rays that can be found on the site, especially at night. On this dive I am not particularly interested in corals, marine species variety etc., so even though the site may not rate well for current, the overall score is still high due to the weighting factor for Pelagics / Mammals / Turtles / Rays. You can view my ratings by dive site for Hawaii and Grand Cayman for more information. Please let me know how you like the rating matrix. Hopefully this information will help you to plan your dives and also to appreciate what actually makes a dive site interesting. If you cannot see it, you might as well be diving in your bathtub. Visibility varies substantially but a minimum of visibility is typically needed to both find interesting marine life, shipwrecks, etc., to being able to safely enter and exit the dive site. 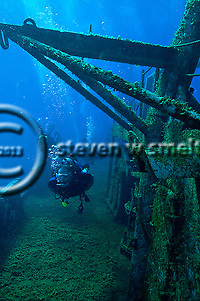 As an underwater photographer visibility is critical to being able to get great shots. If visibility is poor or the water is very cloudy you need to shoot very close to the subject to get a good shot. In underwater photography usually closer is better, so that is not too much of a problem, but again if you cannot see it, then you will probably have a hard time trying to get a photograph. If you cannot reach the wreck due to its depth, or if the shipwreck is only reachable by highly technical divers then the wreck will not be rated highly. However, some of these technical dives are amazing and are worth the effort if you are properly certified and trained. There is a much greater risk on deep dives and only those trained and highly experienced should attempt them. Depths of less than 30 feet are rated the highest, due to the amount of bottom time available and the relative safety of a shallow dive. As the depth increases the rating is reduced. If you cannot get there you cannot dive. This may seem simple enough but ease of access to a site can be a prime motivator in actually diving on the site. There are many of us that will go out-of-the-way to get to a specific site, but if a site is easy to reach and great, you will not hear me complain a bit. If you go rocketing by everything you are trying to see, it is not good, unless it is an intentional drift dive. If the current is strong you also have to think about how long you swim with the current because you will also have to spend time swimming against the current. I highly recommend swimming into the current during the first part of the dive and swimming back to your entry point with the current (where possible). Strong surge can also be a particular concern from both a safety and visibility standpoint. If it is dead then it is not a lot of fun. Other than for documentary or scientific research purposes a dead reef or waterway does not make a great dive. Life and the abundance of life will make any site more interesting and enjoyable. If the wreck is scattered widely across a debris field or is virtually indistinguishable from the reef then it is not much of a wreck dive. Many wrecks are also dangerous to penetrate for all but the most technical and experienced divers. Other shipwrecks are easily navigable and depending upon the size, historical purpose etc., can be very interesting. Wreck diving is a specialty type dive and if you are interesting in diving within wrecks, please take a specialty diving course to be certified as a wreck diver. Finally, I think of Subject Matter or Purpose though this category is not a specific rating or ranking criteria, it is very helpful when planning a dive and completing dive site reviews. If there is no subject or purpose then it is not a dive. This is a little more subjective as we all have “favorite” types of sites we like to explore, be it a wreck site, a canyon, caves or coral garden. The key here is to think through the goals and objectives of the dive, whether it is skills training, finding and taking photos of a certain type of nudibranch, etc. It is better to have a goal on a dive and then consider what you were able to achieve. I have use subject matter or purpose to develop the overall rating scale for each category. Let me know what you think on my rating approach below or send me a note at steven@stevenwsmeltzer.com.